WARNING LA MAISON EST PLEINE ! WARNING THE HOUSE IS FULL ! Il y a déjà 50 réservations d’enregistrées. Si malgrés tout vous voulez toujours vous inscrire, préparez psychologiquement à devoir camper, et qui sait ? peut être devenir la Nouvelle Reine des Neiges !!! 10 Days of work/play to put our land and farmhouse to rest for the winter- and one of celebration & ritual. 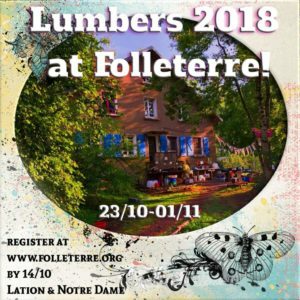 If you feel the Call to be a part of our joyous Folleterre Faerie tribe at this, consistently the most binding and community-minded of our yearly Gatherings.. then you will come.. and be WELCOME! Yes, there has been talk around of capping numbers and waiting lists.. but let us see who feels the Call and trust that all will be well and all who register (By Sunday 14 0ctober please, so we can plan). Your hosts- or “organising team” are Notre Dame and Lation. 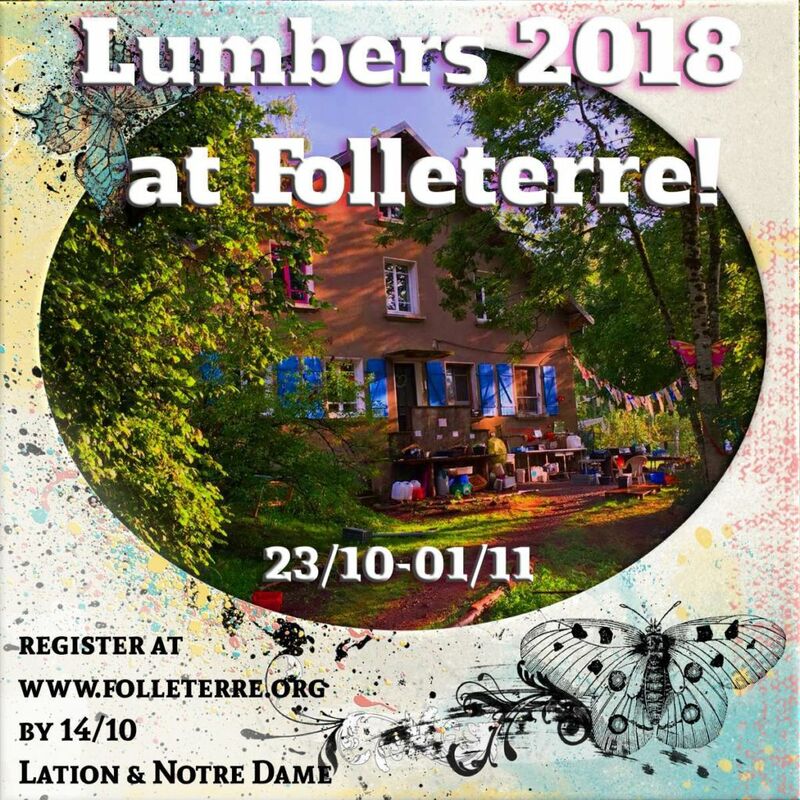 We warmly welcome (and require, please..) your registrations to: lumbers@folleterre.org. Food will be good, nourishing and plentiful.. this, gas, etc does cost money.. so to donations : the general guide is 20-40 euros per faerie per day, but NOTALOF is in our culture (we also add ‘give what you can.. but give something’. Payment by bank transfer or PayPal in advance is great, but cash given on arrival is also fine. Our work is playful, but work it is.. in cheerful terms (or a solo meditation cutting wood or clearing brambles if that is your preference and mood of the day). So bring suitable clothes: something warm, something waterproof, strong work boots or shoes. Torches are essential. Electric light will still be limited. The water shortage of summer will be over. There is work to do in the house, and in our sacred kitchen.. as well as on the land. Something for all talents, ages, abilities. We will stop in timely fashion, eat and have various entertainments each evening. Morning starts will be prompt as daylight hours will be shorter. The post-dinner ritual when the veil between the worlds is thinnest (modern day “Hallow’een) will bring our circle to an close. However, all are invited to remain for “All Saints” on 1st November when we will make a tour of all our achievements and offer affirmations and give thanks to each and every one of us. See you! love, love, love….